The exclusive property of Las Cruces is located approximately 30 road miles south east of La Paz, capital of the State of Baja California Sur, Mexico. 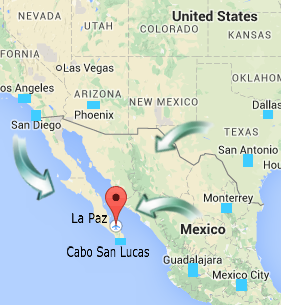 We can arrange transportation to and from La Paz or Los Cabos international airports. For additional travel assistance please contact us. Las Cruces has a 2,788 foot hardpack runway which is available to its guests. The airstrip is identified by LCS. It is approximately 8 miles on the 050 radial of La Paz. The GPS coordinates are: N24 degrees 12 minutes.870 W110 degrees 05 minutes.301 We can provide information on private air shuttle services to Las Cruces from the Los Cabos International Airport. Weather permitting Las Cruces offers a Catalina type mooring should you choose to arrive by private yacht.